Deutzia (Deutzia): growing, planting, caring. 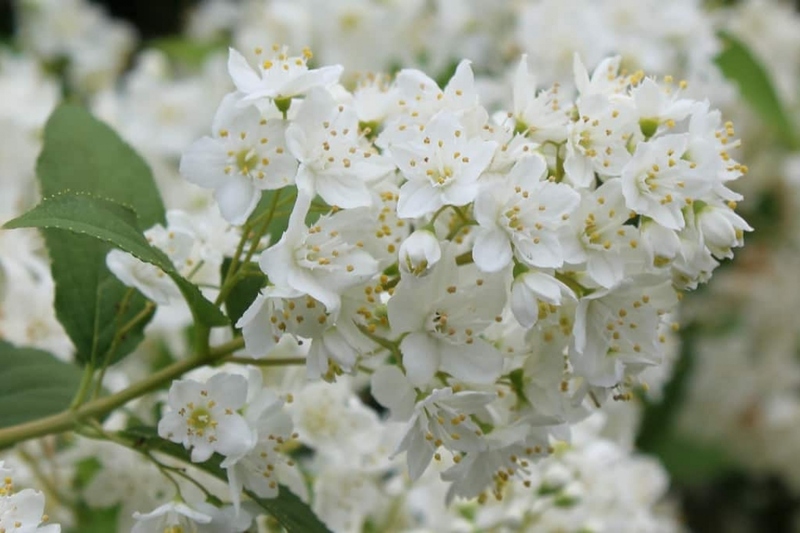 A German-sounding name for an Asian shrub with abundant spring flowering, perfect for flower gardens ! Deutzia is a genus of about 60 species of flowering plants in the family Hydrangeaceae, native to eastern and central Asia. They are shrubs ranging from 1–4 m (3 ft 3 in–13 ft 1 in) in height, most deciduous but a few subtropical species are evergreen. The leaves are opposite, simple, with a serrated margin. The flowers are produced in panicles or corymbs - they are white in most species, but sometimes pink or reddish. Identification of the species is very difficult, requiring often microscopic detail of the leaf hairs and seed capsule structure. Plant the deutzia from October to March out of freezing period - a planting before the winter allows a better rooting - in a sunny situation. Deutzias gracefully accepts any type of soil. In hedge, separate each foot at least 80 cm to 1 m for a hedge about 2 m high. Before planting, prune damaged roots and branches to balance root volume and aerial volume. Plant in a hole at least twice as big as the root ball. Soaking the roots before planting will greatly improve the chances of recovery. Plant being careful not to bury the base of the trunks. Form a bowl around the base that will be used for watering during the first months. Tamp the soil around the roots - do not hesitate to use all the weight of the body! Finally water until filling the planting bowl, at least two watering cans! To plant in pots choose a species with small development. It is imperative for you a large pot or a tray of about forty centimeters. Mix free soil and compost, which you will have on a layer of gravel for drainage. Plant after shortening the branches well, and water copiously. In the first month and in case of drought, water abundantly but not too frequently, so that the roots will fetch water deeper. Water thoroughly, until the soil is full and forms a small puddle around the tree. In pots, mulch twice a year, it's nicer, and it halves watering. In open soil it is essential the first years to avoid the chore of weeding. Afterward, the fall of the leaves will prevent you from mulching in autumn, you will have to worry about it only in the spring. As usual, vary the types of mulching, alternate between dry leaves, compost, crushed wood, etc.